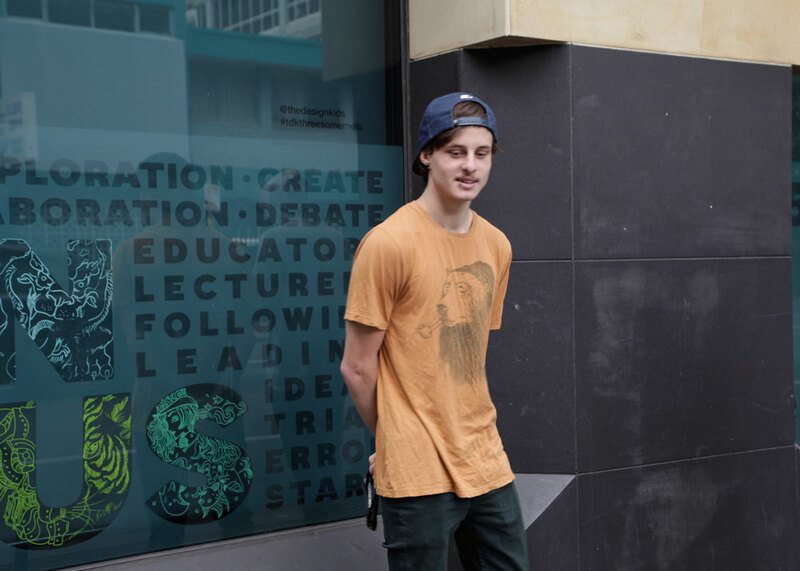 Brief: Working in groups of two, you have been briefed by City Weekly magazine to photograph a CATC lecturer or student to illustrate a feature story about Think Education’s dynamic Melbourne campus. Your portraits should capture the energy and excitement of working/studying at CATC as well as giving a sense of the environment. Research the requirements of the magazine and consider how the commissioning publication uses images. Consider location, your visual approach and equipment requirements. Denise Togara and I are working together on this task. I feel that having two photographer’s points of view and input will lead to a more successful outcome for a first project of this nature. 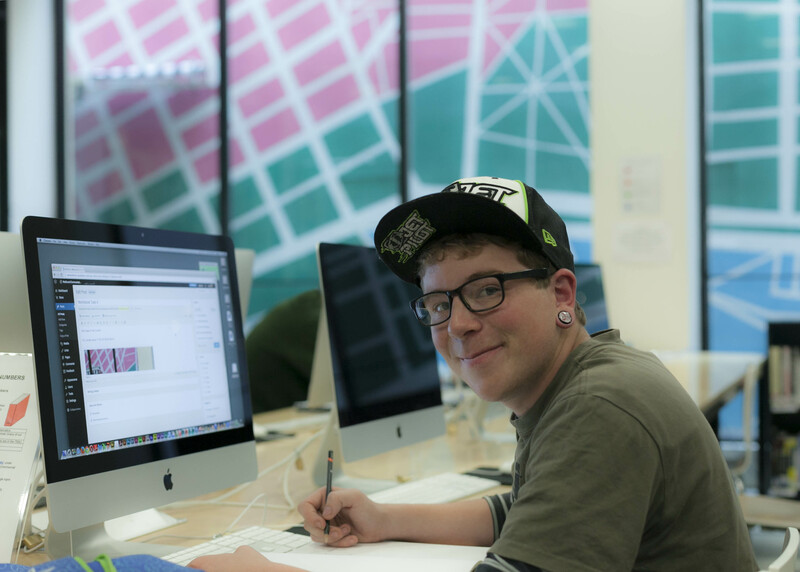 CATC college Melbourne is a vibrant and lively place to work and study, well located near transport, it draws students from all areas of Victoria, many of whom travel several hours each way to take advantage of the high standard of teaching and facilities provided. As the images will be used in a brochure to promote the college, we feel that it is important to take the pictures with identifiable objects or surroundings,not just seated at a computer working on a task. As students ourselves, we asked each other, what attracted us to study here? what part of the college really sums up the atmosphere and professionalism of all the staff?? And we then explored those areas first, and left other areas for later exploration, being confident of finding a suitable location fairly quickly. There are several considerations in place and we have decided to solve any problems as they arise, which will make us better prepared on the day of the shoot. Firstly, a model is required, we are unable to use a fellow class member, instead, having the pool of available CATC students and staff to explore. 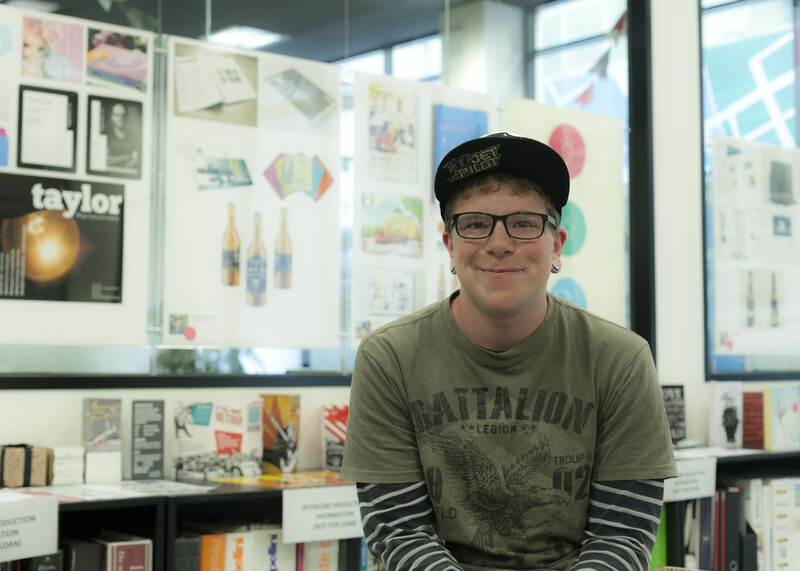 We approached Cameron Durham, a fellow first semester student, studying graphic design. Don is a young motivated student, with a distinctive style and similar interests to my own. He travels quite some way to attend the college of his choice. He wants to study design to “replace all the bad designs in the world, with good ones” A lofty long term goal indeed! As he was kind enough to agree to give up his daily break for us, I offered to supply any props that we needed. Cameron is only available for our shoot on his break at 10am Thursday, so it is important that Denise and I are completely set up and ready to go when he arrives. As we wanted to feature graphic design images in our portrait, to give context and to help Cameron feel more comfortable, we wandered around various areas of the CATC campus, with those restrictions in mind. 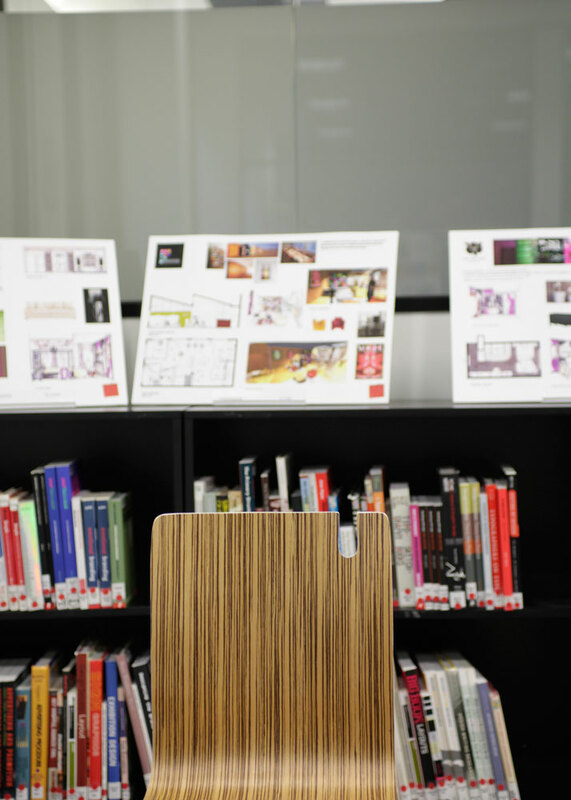 Classrooms are going to be difficult, as so many of them are in use, the Library is very suitable as it has lovely natural light, and several areas that will showcase the CATC and it’s student’s work in a positive light. The mural in the courtyard would be a very creative and colourful background, but being outdoors, is a little weather dependent. The breakout room was also considered, but the proliferation of black lockers does make lighting difficult. Ultimately, we decided on two locations within the Library environment, with a back up location of the windows outside the campus building. A backup location is very important for this brief, as we will be very limited in time, so if the library is quite busy, we need to be able to move immediately to another location that we are comfortable with. The display of graduate students work, the bookshelves and the computer desks will all work as backgrounds to create a sense of efficiency, resources and professionalism that we feel will project a positive image of the college as a learning institution. Your subject is a very busy person and their time is very limited. You have been allocated a maximum of 30 minutes to produce the two compelling images. Consider how to use the time most effectively, or if required, negotiate for more time. One of the methods we intend to use to make the most of our limited time is to take more test shots of both the primary and backup locations at similar times of day, in both overcast and sunny weather conditions, so that we are confident in our camera settings as a starting point. This will minimise the time spent on test shots, and maximise the limited production time. We are confident that by having two primary shoot locations, and a backup location, we will be able to produce strong images that will be of benefit to the college, the model and to us. The backup location has decoration to the college signage done by previous students, and it adds colour and life to the background. As this location is a public thoroughfare, we will need to give consideration to the crowding issue, but test shots with a long shutter speed and a fellow class member as a model show that the passing foot traffic could actually work to our advantage, creating a dynamic image with a great sense of movement, while not detracting from the subject or the message. F 6.3, shutter speed 1/25 ISO 100 @52mm.. this image is deliberately blurry as I was taken by the thought of using a slow shutter speed to have movement in the image from passing pedestrians.. however, none were passing in my first shot! 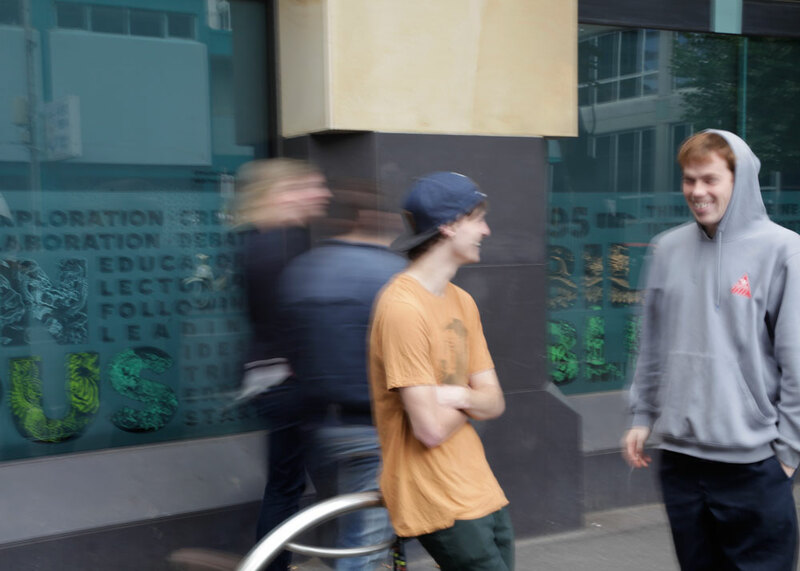 F 13, shutter speed 1/5, ISO 100@52mm – again, deliberately blurred due to unaware models (sorry James and Andrew!! ), as I was focusing more on shutter speeds required to get decent motion blur from pedestrians… naturally, I will use a tripod for the final shoot. Test shots of the library from two separate angles show that a tripod will be needed to minimise camera shake, and a high ISO setting combined with a wide aperture will overcome the lighting issues without the need for external lights. 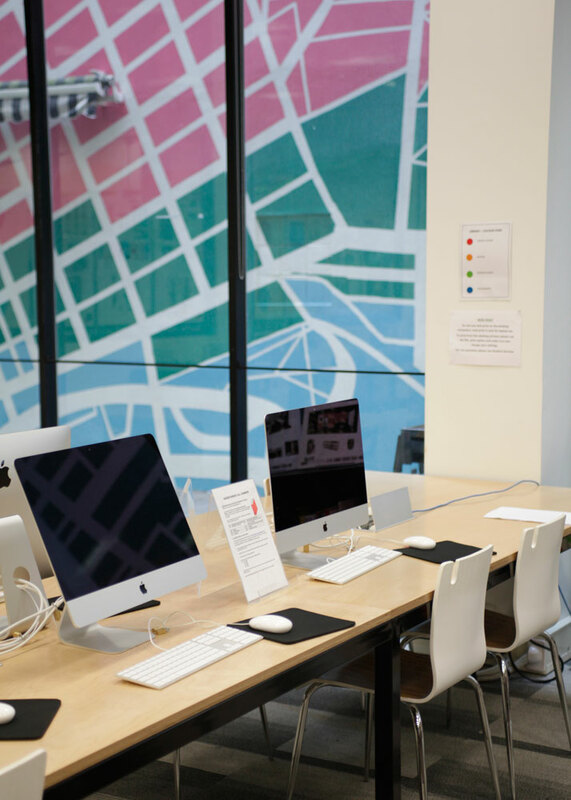 Being able to use the available natural and ambient light, even though it is mixed in colour, means that the set up times will be minimalised, and there will be less disruption to other library users. Come the day of the shoot, and the sun is shining. A rarity in a Melbourne summer, it would seem. Drat you mother nature! The shadows outside are harsh and very unflattering for both Cameron and for the building that we wished to feature. We head inside. Fortunately, despite the hectic pace of trimester end, the library is almost deserted, but we realise it won’t be that way for long. Fortunately, we have our preset settings, and we can work quickly against the available backgrounds, chatting with Cameron to help him feel at ease and taking several images from slightly different angles to increase the chances of a great shot. Here are my two submissions, I think the second would make a great cover image, the first being a good story image.